Slippery Rock University President William Behre discussed what he has learned in his first 75 days as part of his inaugural “State of the University” address. 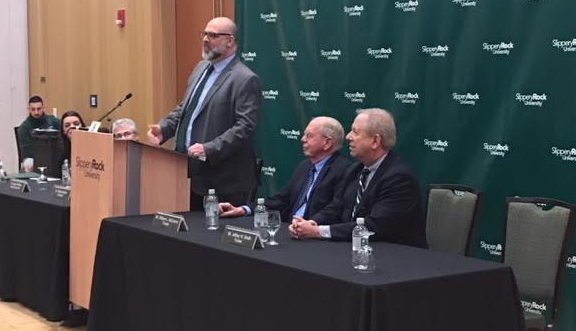 The address took place Thursday in the Smith Student Center ballroom on campus and a live stream of the address was broadcast online at sru.edu. Behre pointed to solid financial figures and reinvestment in campus infrastructure as evidence of the health of the school. To improve concerns about diversity, Behre announced that an additional $100,000 will be put toward scholarships for underrepresented groups this fall and the next four years from a budget surplus last year. The address comes as SRU has- once again- been named among the “Best Regional Universities” by U.S. News & World Report. It is the 10th consecutive year the school has earned the accolade.